Offers: Various discount tee time options available. Contact club for detail. 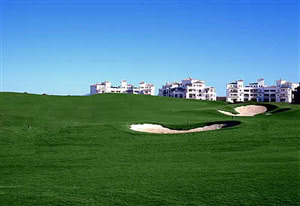 Hacienda Riquelme Golf Resort, part of the Polaris World Group, is located on the ancient estate that bears its name (the Riquelme family are descendants of Guillén Riquelme, a knight who accompanied King Alfonso X on his conquest of Murcia). The resort features a late 19th Century colonial-style building which was the retreat of the Riquelme family around which the Polaris group have built an entire golf resort - villas, shops, gymnasium, bars, restaurants and of course a Nicholas Design golf course. The course is different in design to the other Polaris World golf courses and offers ample fairways combined with hard to approach greens, and bunkers ready to catch any ill-considered or wayward shot. With all of it surrounded by wild flowers, olive trees and several large lakes. In summary, the course will provide challenge to the very best of golfer whilst offering a fun experience to the less accomplished golfer. Visitors are always welcome (contact club to make arrangements).